Little Zombies: Out of My Mind: What if you couldn't speak? Out of My Mind: What if you couldn't speak? Eleven-year-old Melody has a photographic memory. Her head is like a video camera that is always recording. Always. And there's no delete button. She's the smartest kid in her whole school—but no one knows it. Most people—her teachers and doctors included—don't think she's capable of learning, and up until recently her school days consisted of listening to the same preschool-level alphabet lessons again and again and again. If only she could speak up, if only she could tell people what she thinks and knows . . . but she can't, because Melody can't talk. She can't walk. She can't write. I was trying to find books from my sister's reading list that I would like to read from my library. Somehow I had found this book (even though it wasn't even on her list) and I'm so glad I did. Melody has such an easy to read "voice". She's funny. She has real feelings. She's smart. You can really get yourself inside the head of someone with a disability and what they might be thinking. But even though this book is about a disabled girl, it doesn't feel preachy. This book can change your perspective and entertain you as well. The lingo the kids used seemed a bit strange. Maybe a bit forced. But maybe kids really do speak in that manner nowadays. Rated: 4 Bites I really liked it and hope you will give it a chance to fill your tummy. 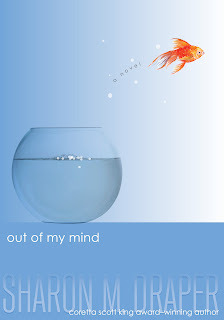 Out of My Mind is available in bookstores everywhere. Princess for Hire: Where do I sign up?